Laura had a stellar early playing career, starting at While Bear Lake High School in Minnesota, and continuing through her years between the pipes at Minnesota State and Quinnipiac University. There was no NWHL when Laura graduated QU, but she did play a season in a women’s league in Sweden. Laura joined up with her present employer, Fairfield Ice Academy in 2011, and although involved in the sport through her work there, she spent roughly eight years without playing competitive hockey. At that time you were more likely to see her honing her managerial skills than stopping pucks. That could have been a happy ending to an a great hockey story, but it wasn’t. Goalies are used to bouncing back up, and Laura bounced back up and into the crease. And it was her extended hockey family that brought her back onto the ice as a player. 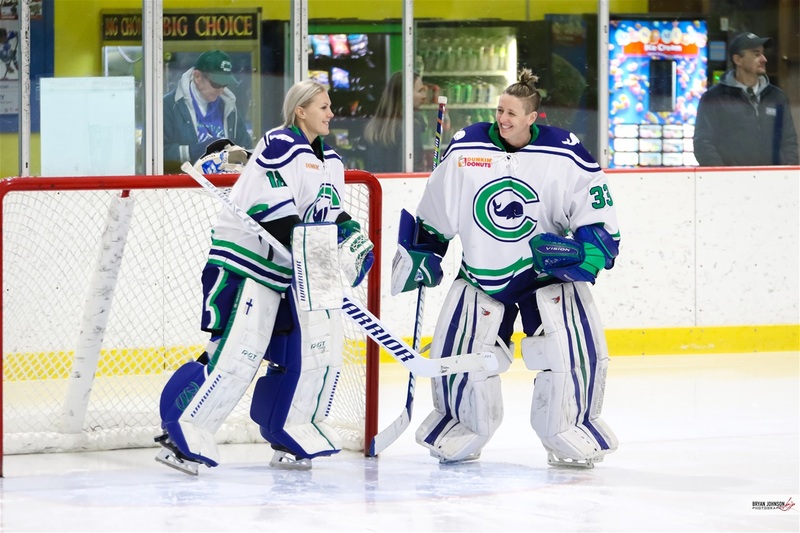 The Assistant Coach she played for at Quinnipiac, Lisa Giovanelli, was now the Assistant Coach in the newly formed NWHL for the Connecticut Whale! She reached out to Laura, who went through the tryout process, and pulled her #33 sweater back on. This time as a member of the Connecticut Whale., where she has been for the last three years. Laura continued “On Saturday, my family was blown away by how good Meeri is. They were happy to meet her and other members of the team. They came back on Sunday with two additional signs. One for Meeri and one for Juice (#25 forward Juana Baribeau) When Meeri got injured and I went in, I had good feelings about how I’d do. I was playing in my home state, in front of a large crowd. Those are the moments where I usually shine as a goalie. Even in hostile territory as an away player, I love that spotlight. Unfortunately, I went in and had the worst period of hockey in my entire career and had it in front of a large crowd and family members. I felt so many emotions after the game; angry, frustrated, embarrassed and also worried about Meeri. In such a tough situation is was so nice to have my family there to comfort me. I remember my brother saying, “I’m just happy we got to see you play, I’d watch you give up 100 goals and still be happy.” We watched that game a couple of times, and although a few goals got in Laura also made some terrific saves, against what proved to be the best women's professional hockey team in the world. We followed up by asking Laura what advice she would offer to the parents whose daughters may be interested in becoming a goalie. Laura gave this insightful reply “Advice that I would give to parents is let them play hockey! If your daughter shows interest, let her try it. There are so many positive things that come from young girls playing hockey. Confidence, work ethic, joy, humbleness, and life long friendships to name just a few. As far as goalie goes, the position isn’t for everyone but if your daughter shows interest let her try it. A lot of times kids think it looks fun and easy but once they try they realize how hard it is and know it really isn’t for them. If that’s the case I think its a good thing because then they have more understanding and compassion for what their team goalie has to deal with.” Laura added “If your daughter tries it and loves it, then you’re in for a wild ride. Get ready for ultimate highs, very low lows. Moments of triumph and moments of defeat. Moments where the puck is the size of a beach ball and she’s stopping everything and moments where no matter how hard she’s trying the pucks squeak past her. Through all of the ups and downs it is your job to be loving and supportive and make sure that she’s having fun. Hockey is a game after all. We can’t let the highs get to high or the lows too low. Like I said, Goalie isn’t for everyone, but for those of us who are Goalies, we are a special breed :)” We can’t speak on all goalies, but we can attest that our remarkable #33 for the Whale is a breed apart. And so, I think we are safe to take her word about the lot of them! Fins Up Laura Brennan for theses great insights you’ve shared with your fans.